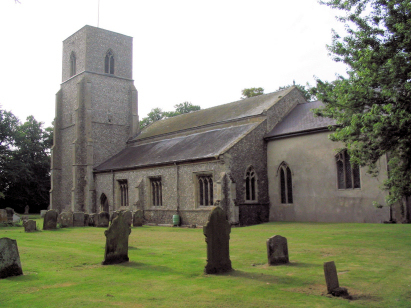 The parish of Great Bircham lies in northwestern Norfolk about 3 miles south of the large village of Docking and 6 miles from Norfolk's Wash coast. Great Bircham stands on the B 1153 road which links Docking through the A148 road (Fakenham to King's Lynn) at Hillington. Great Bircham stands in gently rolling chalky downs, quite high for Norfolk and in an area crossed by the ancient trackway of Peddar's Way, the parish is dotted with prehistoric remains (tumuli from the megalithic era in the main). Whilst sheep would have dominated in the mediaeval era, arable farming would have been the principal activity at the time of this transcript and also today. Corn fed Great Bircham's rather attractive mill which is very much a landscape feature in the area. St Mary's church is rather tucked away behind the houses and south of the main double bend of the B1153 road, it is accessed by the narrow Church Lane. 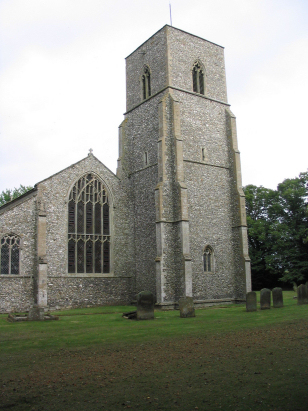 As is usual for a Norfolk church St Mary's shows features from many builds & rebuilds across the centuries. There is evidence that a church has been here since Norman times, the doorway is probably 11th or 12th century. From the 14th centuries comes the impressive western tower, much of the chancel and arcades, later still the nave was clearly rebuilt during the Perpendicular era especially the big 5 light western window. All of the roofing dates from the Victorian era when a major restoration occurred in the 1850s. In short a fairly typical Norfolk church but given its enclosed setting a peaceful spot indeed. Unfortunately not all of the baptismal register for Great Bircham have been deposited. The first register, a standard 800-entry register book is filmed on Microfilm MF736 in the collection of the Norfolk Record Office but the next register, which commences in 1857, has yet to reach the public domain and hence the records here were acquired from the Bishop's Transcripts. The first film is adequate to the task and that section was straightforward to transcribe, the latter period had all the normal faults of BTs. The image quality was at times rather poor, there are omissions due to missing years (or part years) and generally this section should be treated with a little more caution as it is perfectly possible misreads may have occurred. Should the second register eventually be deposited this transcript will be rechecked and completed.